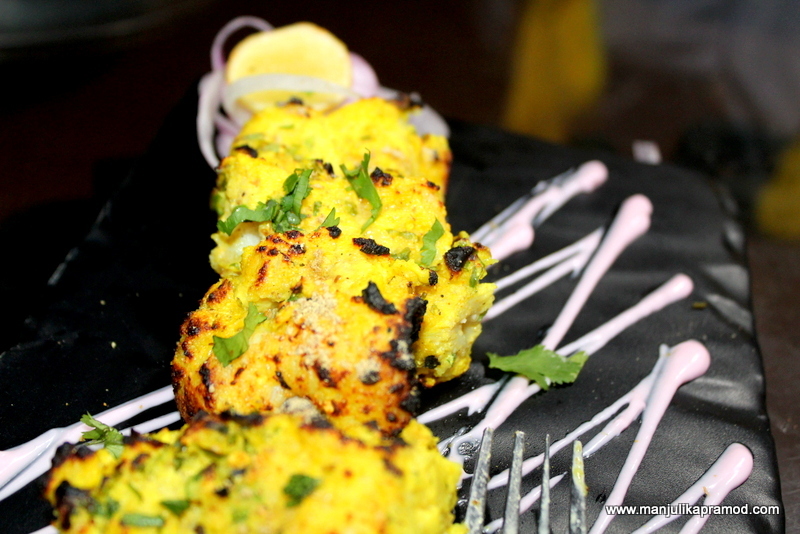 The moment I find a new place to eat, hang out with friends & family, I am back with a blog! This time its LOCKUP. An usual prison isn’t a place to be but you must check this one out. I had no idea what to expect inside and thus I was surprised all the more. No one will force you to wear handcuffs but you will love to get clicked with handcuffs hanging around on the bars. 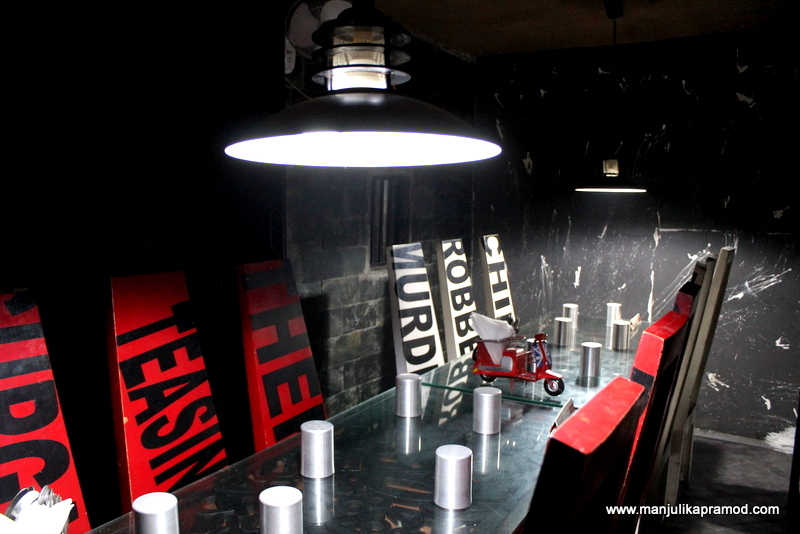 Lockup, a small and cute, prison themed restaurant in Vyaapar Kendra, Gurugram is my latest find for some great food. The outer look makes you feel that you are actually about to enter a place of detention, the interiors live up to the expectations of finding cells separated by metal bars and the crockery is just the way it is served in Indian Jails. I must compliment them for getting the looks and ambiance right. The restaurant is small, a little cramped like a prison but uniquely different from the real jail because they pamper you with great food. I am glad I visited this one. Lock-Up is as real and unreal as a jail! 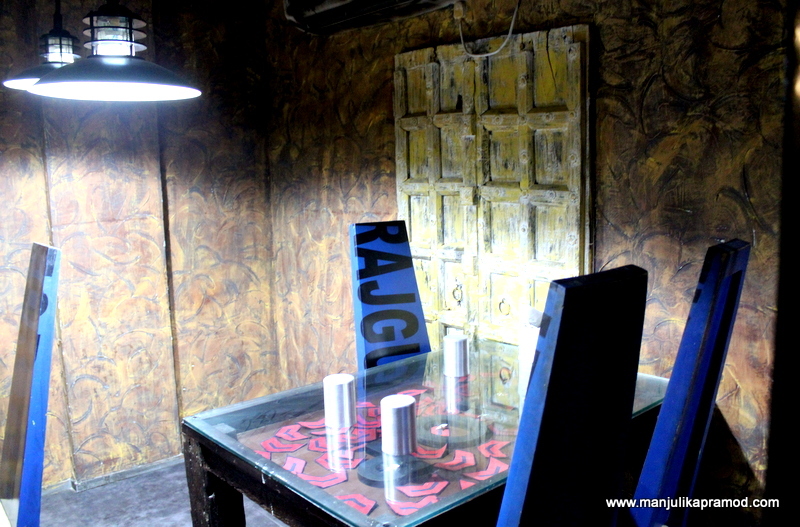 The moment we walked in, the interiors were good enough to make us believe that we had entered a Lockup. We picked the corner-most table which was good enough for three. It was a Saturday and I was out for dinner with my husband. My camera sat happily on the third seat. As we settled in, the menu was placed on the table and we were asked for choice of water. As usual, I went ahead with normal water as long as it was filtered. The menu looked like a hand written newspaper, speaking out in bold and gave interesting twists to the names of the dishes. It was a big and elaborate one. For one moment, I actually wondered how could they prepare so much but soon I learned that they had always been serving North Indian and Chinese offerings while they had lately included continental. Overall, there was enough to choose from. I looked for non-vegetarian delicacies while my husband was excited about digging in the vegetarian specialties. 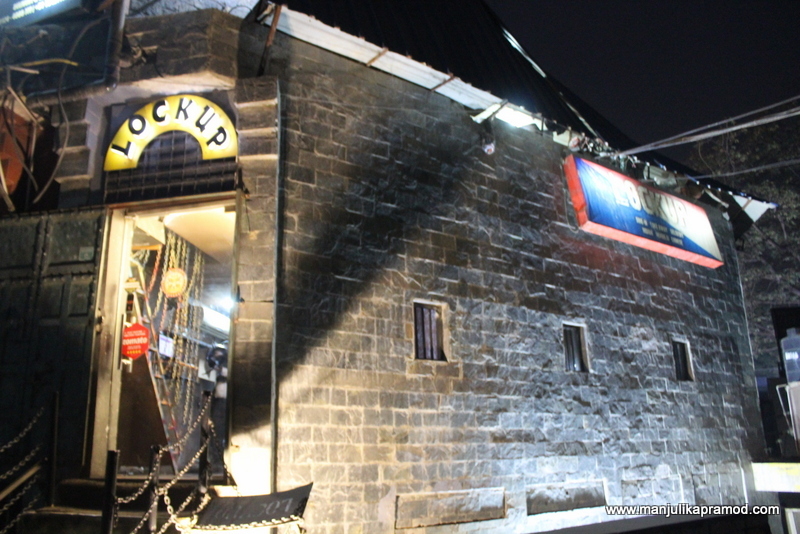 The best thing that we learned about Lock up resturant is that it is open till 3 a.m. and it delivers food as well as serves in the restaurant till that time. And most importantly, it is not a drinking hole. This makes it a good place to stay up till late with friends, family and kids. What to eat at Lockup? When the food arrived, we were convinced that Lockup was really different. They were clear on one aspect and that was that looks matter. So apart from having an appealing name, a different theme for the restaurant, they had done their homework on the palating too. We couldn’t wait to dig in. 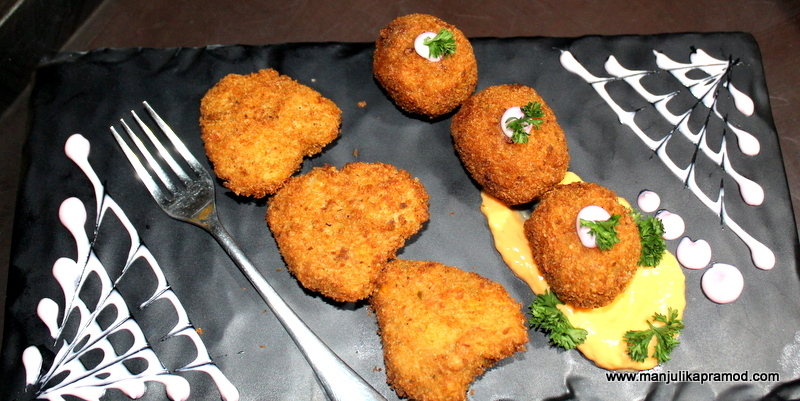 We had ordered Jalapeno Poppers, Stuffed Mushroom Caps and Barbeque Chicken Wings. 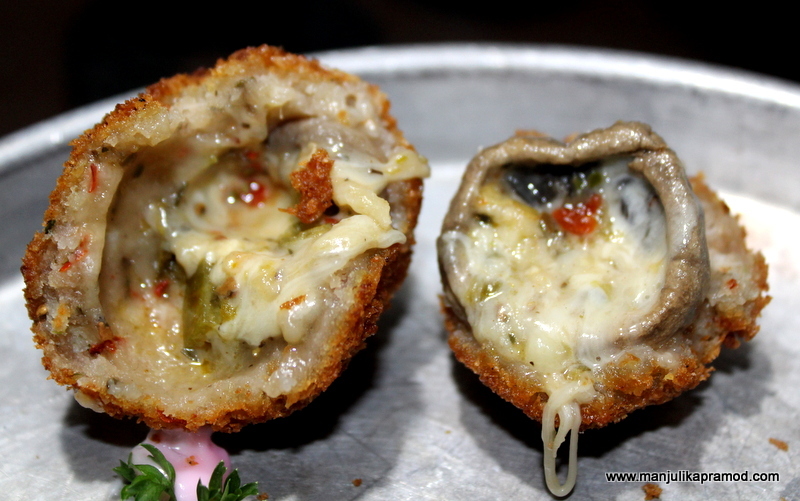 The Stuffed mushrooms were really big in size and the stuffing of herbs and cheese made it melt in the mouth. We totally relished it. The outer coating was fried and crispy but inside it was really soft and kicking with flavors. The heart shaped Jalapeno popper were nice and filling. 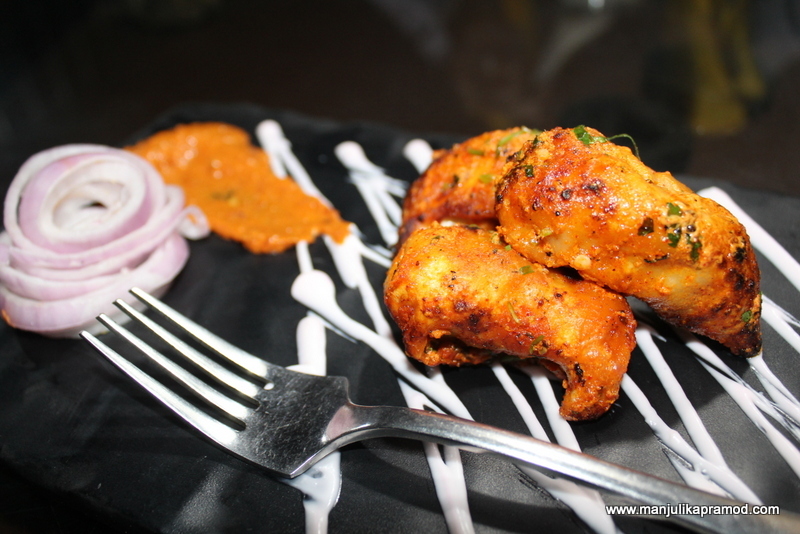 The chicken wings were well done, spicy and creamy but they were not one of the best that I had had. The stuffed mushrooms were the best so far. Next we ordered Talumein soup along with Veg platter. The soup was good break on the chilly winter evening. It tasted nice and was filled with lots of fresh veggies. It was made to my taste and I enjoyed it. The veg platter was a very colorful and delicious setup. It had Paneer tikka, Tandoori Soya Chap, Malai Broccoli and Dahi ke Sholay. 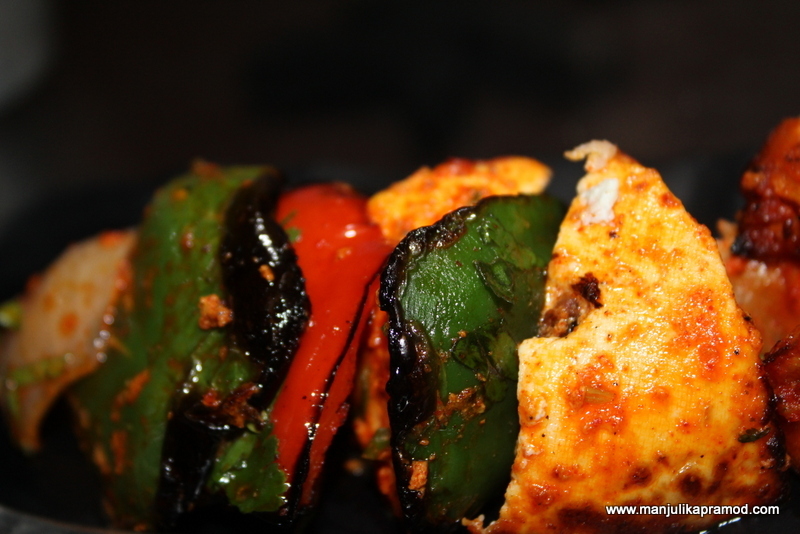 The paneer and soya chap were roasted nicely, and quite soft to eat. Dahi ke Sholay was big in size and looked extremely tempting. We couldn’t wait to put it in our mouths. Broccoli was nicely marinated in cream and the taste was really exemplary. My husband relished the veg platter and I would also recommend it as I had a bite of everything. Next, I ordered Tandoori chicken momos. They came out really well and were surprise of the day. 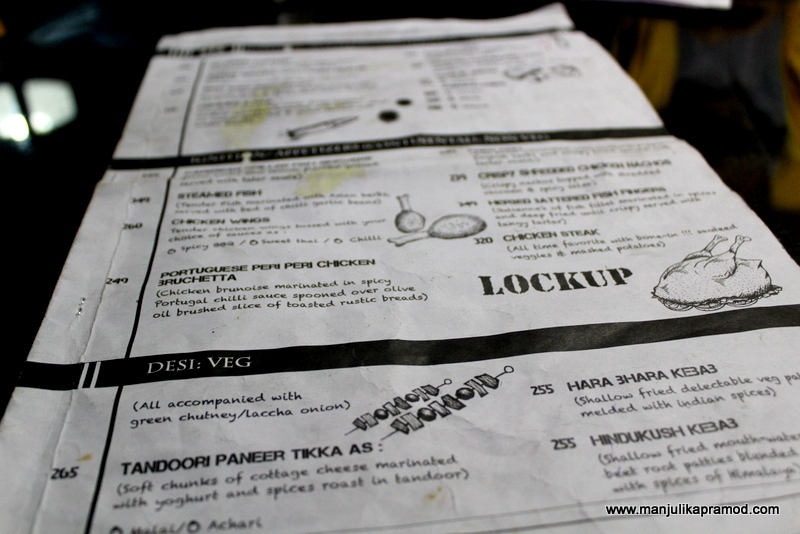 I am fond of tandoori momos and I am glad Lockup lived up to my expectations. The spicy sauce that came along added a perfect zing. One should be very cautious of not eating a spoonful in one go. 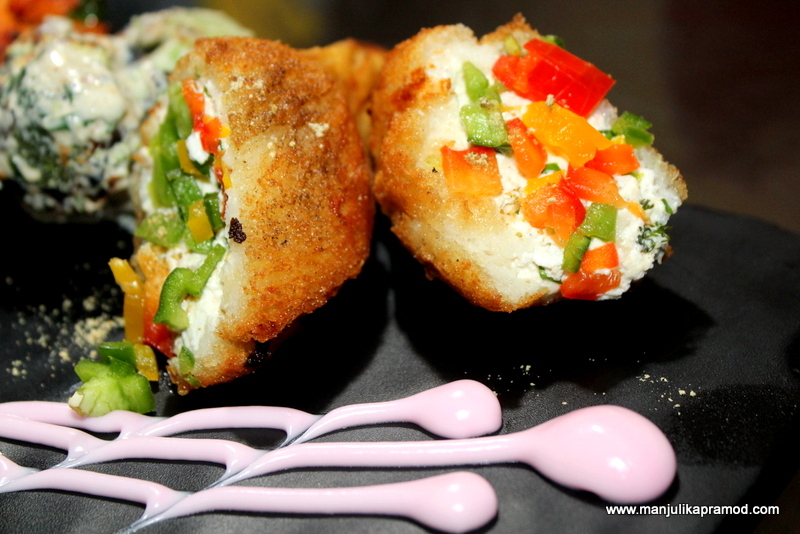 Cheesy stuffed mushroom set the standards very high. Our expectations grew after tasting this. After we had had enough of starters and touched upon a variety, we ordered main course. 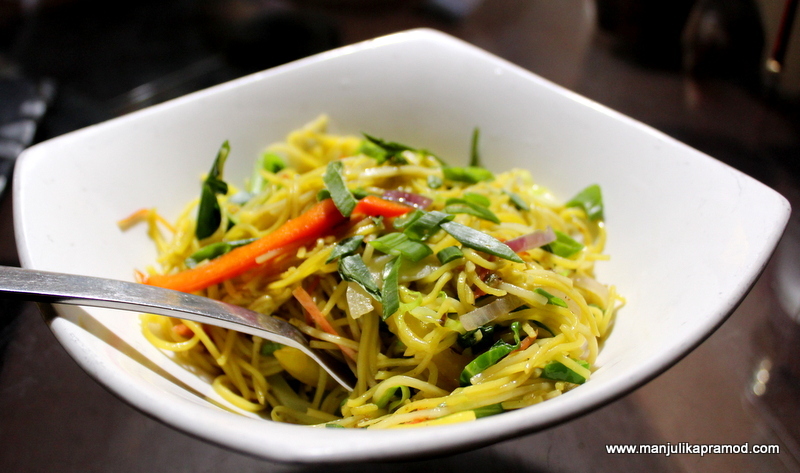 I decided to go ahead with Macchi Nimbu Mirch and Hakka noodles while hubby ordered his favorite, Thai green curry. I was not sure if they would do justice with the latter but I let him do. The fish dish was well done with the lemon flavor clearly winning the show. The fish tasted fresh and extremely soft. I would give them full marks for this one. The veg Hakka noodles were filled with lot of veggies, and less soya sauce (which I prefer) but Thai green curry was clearly the winner on the table. 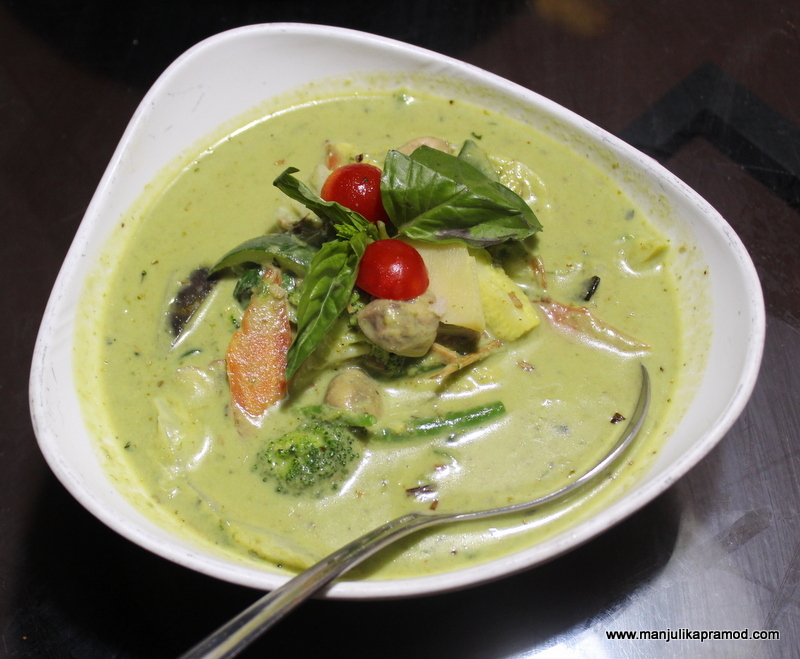 It was served with boiled rice and I can vouch that this was one of the best Thai curry I had had in Gurgaon. It had lots of herbs, spices and was filled with loads of fresh vegetables like broccoli, mushroom, carrot, baby corn, pok choy, etc. The flavors were just perfect. 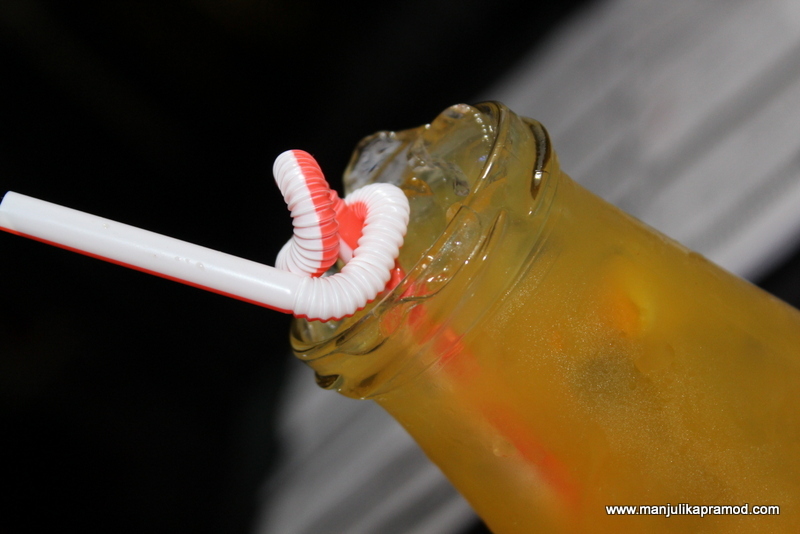 We did not taste the desserts as we were already full but to end the inspection on a sweet note, we ordered one of their famous mocktails “Oye Bubbly”. It was made from orange and peach. There were fresh pieces of orange and the after flavor was quite relishing. I am sure the food pictures are already telling their own tasty tales. 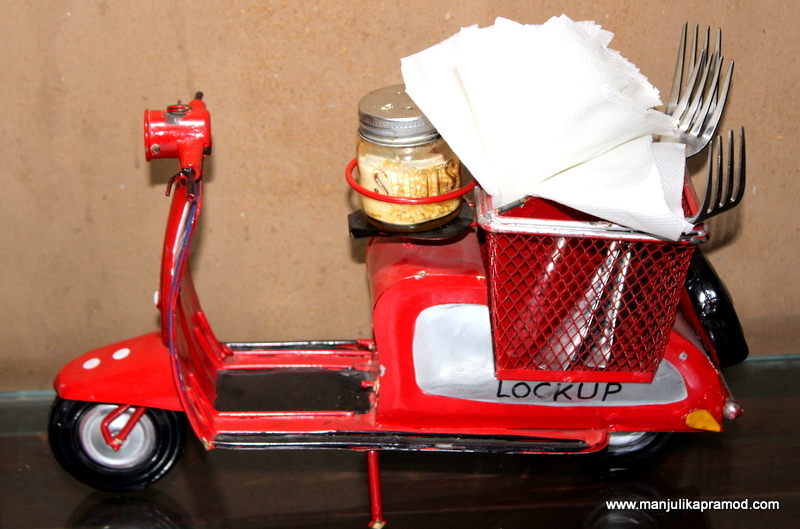 The best part about Lockup is that it remains open till 3 a.m. so if you are one like us who go for long drives and look for food in the wee hours, this is the place if you are in and around Gurgaon. They deliver too. Overall, I would say it is a good place to have fun with office friends, school pals or family. If you are looking for too much luxury, this isn’t the place but if you are looking for good food in a small and cozy, theme based restaurant and are up for trying something new, you will like this one. Interesting theme for a restaurant…the food pics are awesome…drool-worthy! Interesting theme, warm and cozy and some great food defines Lockup for me. I really didn’t know what to expect but the cell like arrangements on the inside is a good way of serving food. Moreover, they have a great chef who not only cooks great but also decorates it. I relished most of the things that I ordered. There was nothing that disappointed me. 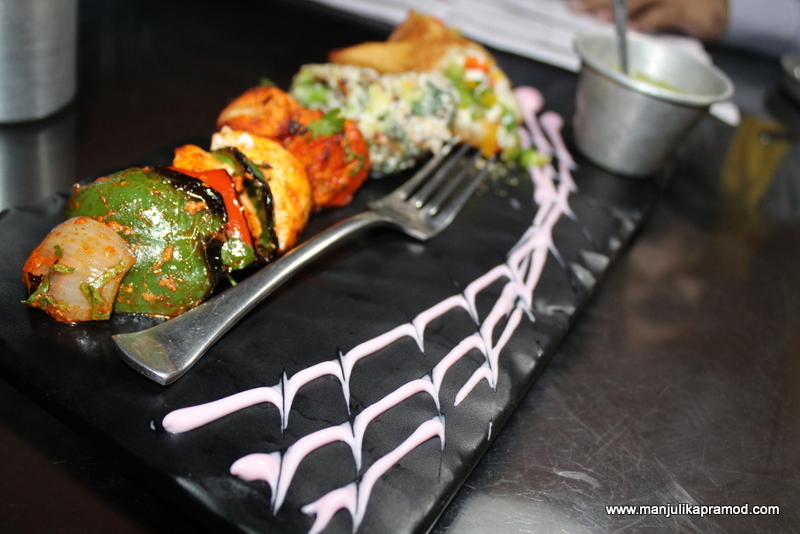 The Dahi ke sholay, the cheesy mushroom caps, the Macchi nimbu mirch was very nicely presented and cooked. 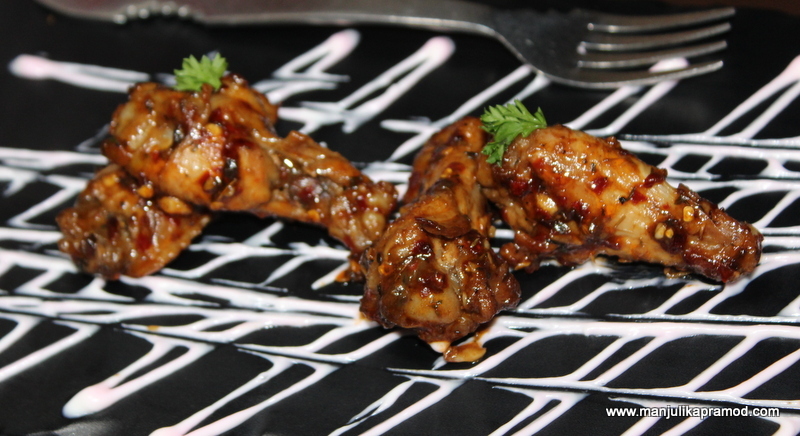 The barbecued chicken wings were not great but again the chicken tandoori momos and veg Thai curry had perfect flavors. And I must mention, they are not a drinking hole and they are open till 3 a.m.